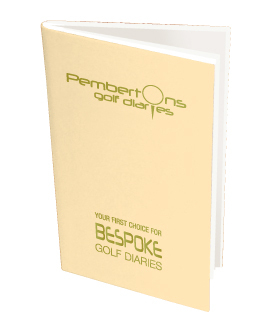 "Bespoke diaries to suit your requirements"
Very popular and a classic design. Gold blocked and hard case bound with a simulated smooth or embossed leather effect cover. Purpose made for your golf club. 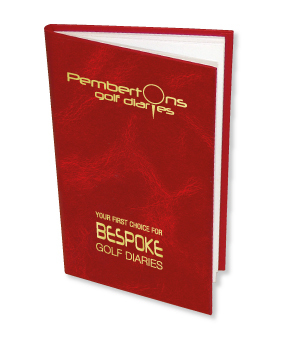 Produced to the same high specification as the Traditional hard back golf diary, printed in full colour and hard case bound using your own photograph of your clubhouse or course. Has an attractive gloss card cover in a wide choice of colours. This cover can be printed or gold blocked. Fixtures appear on the day that they happen. At-a-Glance listings page if required. Use the diary as a tool to inform your members of local rules, important dates etc. 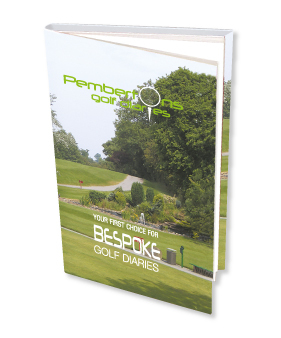 Supply your fixtures and membership list in the format that suits you. We can receive your copy in any of the popular formats, MS Word, Excel, text, PDF even hand written notes if that's all you have, we're here for your convenience. Have your fixtures printed in any colour, font, size or style we'll do exactly what you want. Your order is backed up by an experienced design and print team, alongside our own in-plant finishing and binding facility. Why not celebrate a landmark anniversary with a special edition diary. Call our experienced team with your ideas and thoughts for a no obligation quotation.